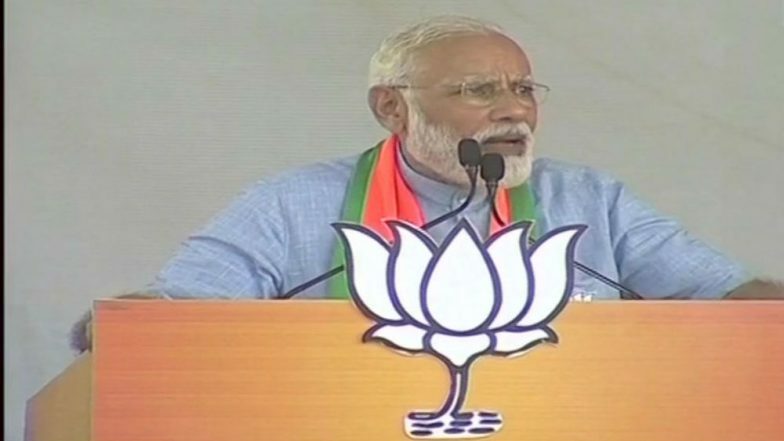 Lucknow, April 14: Prime Minister Narendra Modi on Sunday in an election rally at Moradabad, warned Pakistan and said that "Pakistan knows that if the third mistake is committed after Uri and Pulwama, it will prove very costly for Pakistan." PM Modi also targeted the Congress party and said that "earlier when terrorists attacks took place, Congress used to cry in front of the whole world." Election Commission Issues Advisory Barring Political Parties From Using Defence Personnel Photos For Campaigning. The Prime Minister then went on to add that "this is new India and it will not take any terror attack lightly" before warning Pakistan. India Called Pakistan's Bluff with Air Strikes, Says PM Narendra Modi. "Terrorists used to come from Pakistan, attack us & Congress govt used to cry before the world that we've been attacked. But this is new India. When terrorists attacked Uri, brave soldiers of the country conducted surgical strike there," said the Prime Minister at the rally. Jammu And Kashmir: Suicide Attack Kills 40 CRPF Jawans in Pulwama, JeM Releases Terrorist Aadil Ahmed’s Photo Who Carried Out Fidayeen Strike. The 2016 Uri attack was an attack by four heavily armed militants on 18 September 2016, near the town of Uri in the Indian administered state of Jammu and Kashmir. After the attacks, India security forces conducted "surgical strikes" on Pakistani soil and eliminated terrorists launch pads. PM Narendra Modi Lookalike Files Nomination From Lucknow For Lok Sabha Elections 2019, Says Will Support Rahul Gandhi After Winning, See Pics. On 14 February 2019, a convoy of vehicles carrying security personnel on the Jammu Srinagar National Highway was attacked by a vehicle-borne suicide bomber at Lethpora in the Pulwama district, Jammu and Kashmir, India. The attack resulted in the deaths of 40 Central Reserve Police Force personnel and Jaish-e-Mohammed (JeM) claimed responsibility for the attack. The Indian Air Force (IAF) conducted aerial strikes deep in Pakistan's Balakot on one of JeM terror training camps, said reports.